Nigerians Feel Good About Their Well Being? 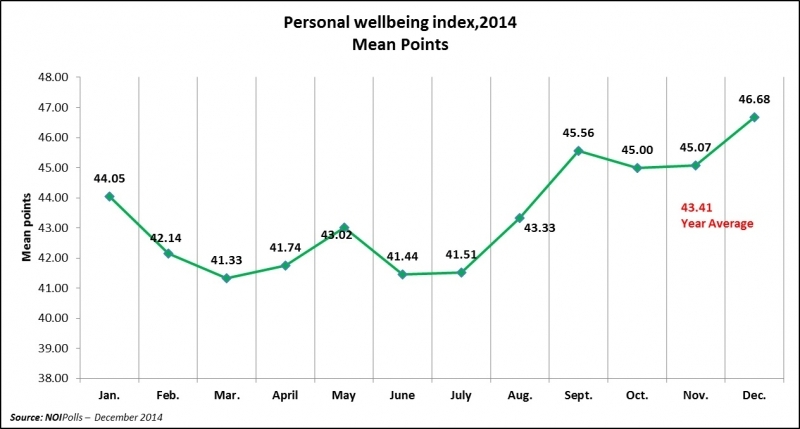 So, personal well-being in Nigeria is trending upward, according to data compiled by NOIPolls. December produced the highest results for the year – a month when the naira stumbled significantly, the Nigerian Stock Exchange went for a wild ride, and Boko Haram deadliness persisted.More than anything, I think this displays the resiliency of this country’s people. President Jonathan’s team must be pleased to see these results with elections approaching next month. Here, you can see the dive the naira took in December. Here is Nigeria’s All Share Index for 2014. You can see the ride the market went for in the month as foreign investors sold off and local investors filled the void. Here is a tweet Ian Bremmer sent out on the fatalities by Boko Haram.